AFC North rookie grades: Anyone topping Baker's Browns? Published: Oct. 21, 2018 at 08:43 p.m.
Cleveland Browns defensive end Myles Garrett strip-sacks Jameis Winston for key turnover. Published: Sept. 30, 2018 at 07:38 p.m.
Oakland Raiders quarterback Derek Carr finds the wide open wide receiver Amari Cooper for 31 yards. Published: Sept. 20, 2018 at 11:43 p.m.
Cleveland Browns Terrance Mitchell ends the game with a New York Jets quarterback Sam Darnold interception. 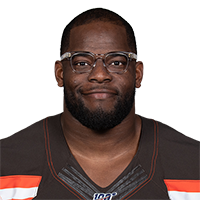 Published: Aug. 23, 2018 at 09:08 p.m.
Cleveland Browns line backer Genard Avery smacks ball out of Foles' hand for fumble.